Earlier this week I was at 7 Digital’s Annual Media and Partners Meeting. At the start of the year 7 Digital hit their 7 Year mark, which in Internet Years is probably equivalent middle age. 7 Digital now have 3 million registered paying customers (of which 30% are active) but what is most interesting is the impact of mobile downloads on their business. Since launching direct-to-mobile paid downloads the segment has become 7 Digital’s most dynamic growth area: in November 2010 mobile device sales accounted for just 1% of total sales, 1 year on and that share has rocketed to 44%. (Online sales also grew, so this is a case of strong growth in both relative and absolute terms). 7 Digital’s CEO Ben Drury used the data shows that ownership isn’t dead. He has a point. In these days of cloud and streaming dominated debates it is easy to be led to believe that ownership is an outdated legacy of the analogue era. Of course in many ways it is, but the unavoidable fact is that we are in a transition phase in which both ownership and access matter and it is a stage which has many years to yet to run. The generational changes are slowest moving, almost glacial in pace. Yet they give the impression of being quicker than they actually are, because such a small subset of the total population is currently active in digital music. These 10-20% of consumers (of which I and probably you are part) are not representative of the total consumer base. But even among us there are discreet groups. I am of the age group that grew up with CDs. I am part of the transition generation that has enthusiastically adopted digital but still understands the value of physical media and ownership. The Digital Natives however (i.e. those consumers who have grown up in the digital age without ever having learned the habit of buying physical media) have entirely different concepts of ownership. These are the true vanguard of the shift towards access based models. But they are young, so time rich as they might be they are also currently cash poor. Thus they are opting for free alternatives, such as YouTube, Pandora, Spotify Free. Only when they start to acquire increased spending power will they start to be the dynamic force in adoption of paid access based services. Meanwhile, the digital hold outs – i.e. the majority of the total population – are being left behind as the digital music bandwagon rolls on. Out of habit some of them still buy CDs (some of them even buy a lot of CDs) but most are just falling out of the habit of buying music. Their sense of ownership however remains unchanged. In their world view you either buy music and own it, or you listen to it on the radio or TV. Their worldview remains wholly un-muddied by cloud and streaming services. If Generational-led Change is the slow moving backdrop to the access / ownership debate, then Technology-led Change is the fast moving current, the rip tide. It is technological change which underpins Spotify’s conversion of 2.5 million paying customers (Napster and Rhapsody both offered portable rentals years earlier, but not cached streams). It is technological change which Pandora has to thank for its 100 million users (adoption only truly lifted off with the launch of the Pandora iPhone App). Better technology and better connectivity are making the constraints of access based services less visible. So it looks like a narrow victory for ownership, but I’d argue that a tie is a more accurate assessment, because ‘Play everything’ and ‘Share with everyone’ are so important that they carry extra weight. These factors are core to what makes music different in the digital age. They are foundations stones for building new pillars of value around music in the post-physical era. And so we have a situation where the case for Access is building all the time, driven by advances in technology (especially mobile), but those same advances also bring limits which extend the case for Ownership. Mobile is becoming core to the digital music experience, and will only become more so over the coming years. Right now it is simultaneously encouraging people to buy downloads to guarantee portable access to their music as well as allowing subscription users to take their streaming experience with them on the go. There is no doubt that Access based models are the future of music, but there are many, many years yet in which Ownership based models will continue to play a pivotal role. Ownership and Access better learn to get along together, because they are going to be roommates for a long time yet. 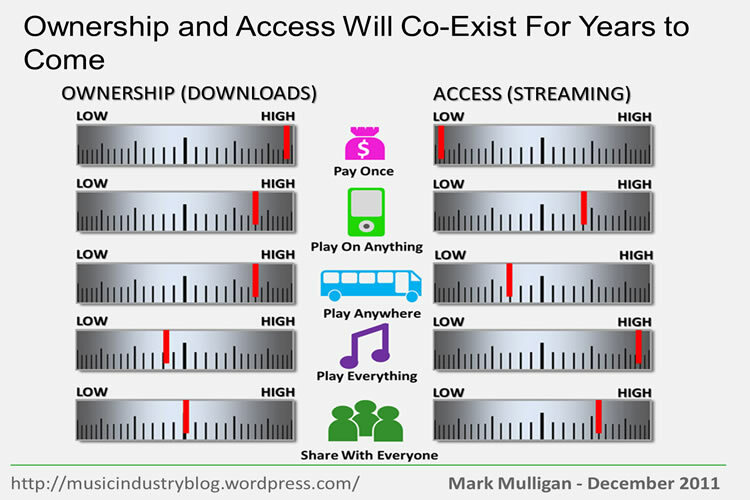 This entry was posted in Music, Paid Content and tagged 7 Digital, A la Carte Downloads, Digital Downloads, Digital Music, iTunes, music retail, Ownership versus Access, Streaming Music, Subscription Services by Mark Mulligan. Bookmark the permalink. Great article! Right now I am using Spotify on Desktop because it’s the best I’ve seen as afar as GUi and selection. No downloading, categorizing, taking up space on HDD, 3dtags etc. I think it all depends on your preferences. I really don’t want to own any more music. In fact, I’ve been deleting some to get space since I started on Spotify. I do plan on using their mobile ap for streaming in car/on the go as well. Great article Mark! I dont think ownership will ever be gone. I think people always want to know they own something and can do as they wish with it. Access just doesn’t allow that so i think the two will, as you said, co-exist for years to come and never actually fully die. I don’t think ownership will disappear anytime soon either. However it may be possible that a new form of ownership may come into play. With music being streamed freely by somewhat 90% of all users, some artists (especially independent) see it no point in making people pay money for a track they can so easily access via streaming sites. Plus there is so much competition, people want to own music they like, so people are most likely to pay for music from an artist they are familiar with. For this reason, and more, I think artists will gradually let out their music for free (maybe not all artists, ut many are doing so now).